I know that I'm old now and I've been living on my own (not counting the college dorms) for over 6 years, but I'm sort of sentimental from time to time about growing up. See, I have this spoon holder that sits next to my stove. My Mom gave it to me when I got my first apartment. It was kind of that first "grown up" item - the first thing I got that really made me feel like an adult. It has broken before and Ken repaired it, but I think that it might be time to retire the poor dear. 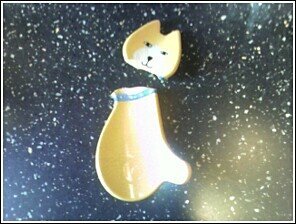 That's the cutest spoon holder ever! Sorry to hear it broke.